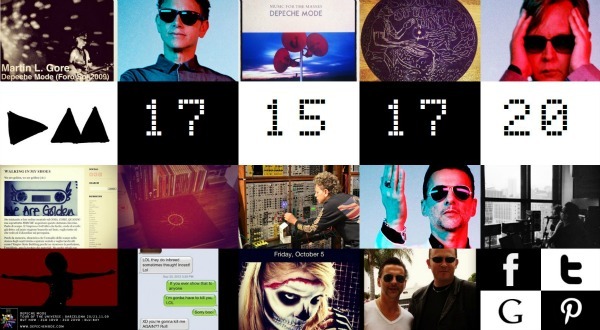 Depeche Mode today launched a digital countdown clock online that appears to be ticking off the time until Oct. 23, which fan sites in recent weeks have reported is the date reserved for a Paris press conference at which the band is expected to announce details of its new album and 2013 world tour dates. Depeche Mode this afternoon tweeted “17 15 30 1 depechemode.com,” which sends visitors to countdown.depechemode.com, the site hosting a collage of flashing images, the countdown clock and the date 10/23/12. The group has spent several months in the studio earlier this year working the follow-up to 2009’s Sounds of the Universe, which is due out in April 2013. The band already has said a full world tour is in the works for 2013. Check out the countdown for yourself at countdown.depechemode.com. UPDATE 10/8/12: Depeche Mode today officially announced the group will hold a press conference at 1:30 p.m. Oct. 23 in Paris “where they will be making an exciting announcement,” according to a news release from the band’s publicist. The press conference will be broadcast online; watch depechemode.com for more details. I live in Chicago and I swear to god if DM fucks us over again for the third time (first by canceling the 2nd show on the Angel Tour, second by playing Lollapalooza with no headlining gigs) I’m disowning them…..
yeah i hear what your saying. i was deployed last time in 2009 i had been station in coloroda when they came. but now that i just got out im hoping nothing goes wrong and i get to see them in chicago. This is DM’s last chance. Exciter was dogshit, PTA was decent, but SOTU was garbage. I really hope DM make a good record this time. Otherwise it’s over. “Depeche Mode today officially announced the group will hold a press conference at 1:30 p.m. Oct. 23 in Paris The press conference will be broadcast online; watch depechemode.com for more details.”???? Are you sure? I don’t read anything on their official website!! I disagree completely in regards to Exciter, i thought it was a great and interesting album then and i still do to this day, Freelove is one of my favourites. PTA is up there with Violator & Devotion imo as one of their finest albums. As for Universe, i liked a few songs but the production was seriously lacking so i’ll give you that one. In regards to this being their “last chance”, what are you talking about? Both Exciter and PTA were big sellers, most critics liked them, the subsequent tours were huge successes, Depeche Mode are an unstoppable juggernaut, that will never change as long they stay together. Universe was great! Can’t believe it’s getting hate. Listened to it just this past weekend. Oh Well. I dont hate Universe, i still think Wrong is one of their best singles, but the production was weak, songs like Fragile Tension and In Sympathy should have been way more lush and orchestral, instead they came out sounding very twee. Sounds of the Universe was a classic to me, what’s wrong with you people?! Not a single bad track. And I doubt Alan Wilder will ever come back… ever.